Experiencing a golf vacation in Scotland is nothing short of a pilgrimage and we can help you enjoy such an adventure in grand style. It was in the eastern links land of Scotland where the game of “gowf” was invented more than 500 years ago. 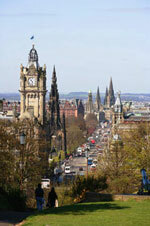 golf, culture, spirits (yes this is the birthplace of "whisky," too) and cuisine. The proud and friendly Scottish people will be delighted to share their 8,000-year history with you. You can take in the regal splendor of Edinburgh, Scotland's delightful capital, the energy and Victorian splendor of Glasgow, its largest city, or the charm of small towns such as St. Andrews or Linlithgow. No visit to Scotland would be complete without off-the-beaten-path excursions through the Scottish countryside filled with raw peaks, intriguing lochs and salmon-filled rivers. While the Old Course at St. Andrews, the most famous of Scotland's more than 550 golf courses, needs no introduction, there are numerous other must plays—so many that you will want to make repeated visits to Scotland. 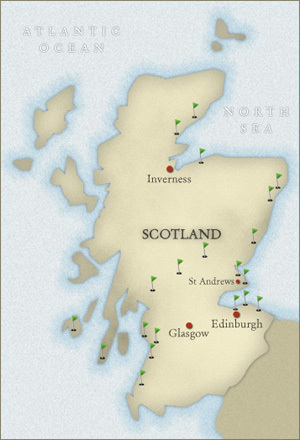 CORK & TEE golf vacation itineraries in Scotland typically include a base in St Andrews, where we can obtain guaranteed tee times at the Old Course, and then a base in either The Highlands to the the north in the Inverness area or in the west at Turnberry. Near St. Andrews, Muirfield is home to the oldest golf club in existence-the Honourable Company of Edinburgh Golfers-and is considered by many to be the best course in the British Isles. Its design includes no gimmicks and no blind shots, but is unique as the two nines form concentric circles that run in opposite directions, thus challenging the player with winds from every direction. Muirfield's relative exclusivity and its distinction as the only course ever to host the Open Championship (15 times, no less! ), the Amateur, the Mid-Amateur, the Ryder Cup, the Walker Cup and the Curtis Cup only add to its splendor. Few courses across the globe boast the history and drama that The Ailsa Course at Turnberry does. Teetering along the southwestern Scottish coast, this celebrated track hosted the legendary duel between Nicklaus and Watson in the 1977 Open Championship-Turnberry will host again in 2009. 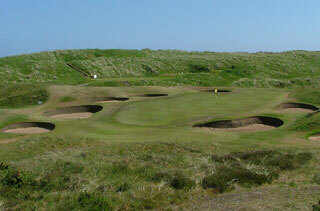 The golf historian's life is not complete without tackling The Ailsa Course. And in The Highlands, just an hour north of Inverness, lies the Championship Course at Royal Dornoch, adjacent to the town of Dornoch, the birthplace of famed architect Donald Ross. Aside from its place among the finest courses in the world, Royal Dornoch was the first to employ Donald Ross as greenskeeper, and is a favorite of Tom Watson and Ben Crenshaw. Traditionalists will delight in its straightforward design. Beyond golf are other experiences for cultural immersion. Scottish cuisine is outstanding and takes advantage of famous Aberdeen Angus beef, a wealth of shellfish, salmon and other fish, and exceptional cheeses. A CORK & TEE experience also can include participation in any number of exceptional "cookery schools" as well as visits to historic and celebrated scotch distilleries and farm shops. Accommodations range from charming country house hotels to venerable hotels catering exclusively to golfers.